UVC-G3-LED is IR Range Extender Accessory for Ubiquiti UVC-G3 camera. LED Ring Houses six high-intensity infrared LEDs for extended night vision range. IR Range is up to 25 meters. Accessory Connector Connects to the UVC-G3 for power and IR control. 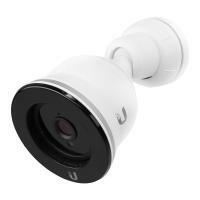 The UVC-G3-LED may be enabled using UniFi Video or directly through the camera UI. Once enabled, the UVC-G3-LED will automatically turn on under low light conditions. To use this accessory you have to find and turn on option "Enable External Accessory". WARNING: Do not connect any device to the accessory port on the UVC-G3. Damage to the device may occur. The accessory port is designed for use with the UVC-G3-LED accessory only. Check Quick Installation Guide for instructions.